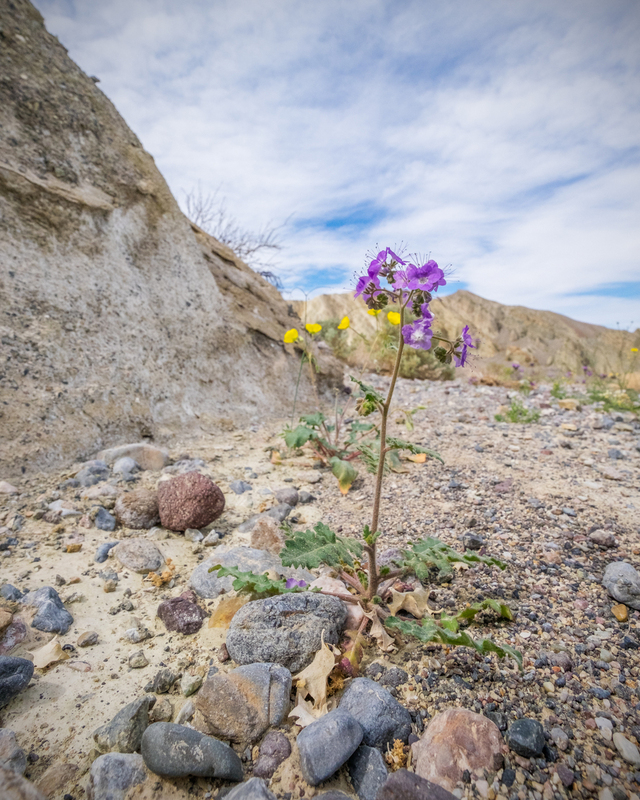 The Death Valley National Park wildflower bloom is a sight to behold! I was there last week photographing with my friend and photographer Les White for five days. We were shooting before the sun was up and after it went down. There were even times when the light was decent in the middle of the day, thanks to some nice cloud cover to soften the light. Half of the time, we were laying on our side on the rocky valley floor shooting up at the wildflowers – not to mention getting bit by unknown insects. It's a rough life doing what you love! Desert Gold (a.k.a Geraea canescens) is the dominant flower you see when driving through the valley. However, get in close and you will see spectacular displays of Sand Verbena (Abronia villosa), Golden Evening Primrose (Camissonia brevipes), Purple Mat (Nama demissum) and one of my favorites - the delicate Desert Five-Spot (Eremalche rotundifolia). This pink variety of ground mallow has five beautiful red eyes staring back at you. Of course there are more flowering varieties than you can count with both hands (and feet). Don't I sound like a smarty pants flower expert - thanks to Google! On the technical side were, we fortunate to have great light and very little wind. Most of the time it was easy to achieve a fast shutter speed to help freeze any flower movement in order to get sharp images. Often a tripod was not necessary. I also needed to push myself to use a wide angle lens (10-24mm) more often. The key is to get the lens really close, within a couple inches, of the flower. This allows you to fill most of the frame with the flower and also place it in context with the background to tell the story. I believe there is still time to travel to Death Valley to view the wildflower extravaganza. I noticed that there is a 30% chance of scattered showers today (March 7) and 20% chance tomorrow. Hopefully, that might extend the bloom another 2-3 weeks. Please enjoy the slideshow of my favorite images. Feel free to comment or ask questions below.